Her name may be a little hokey, but she's all class - as are all Torties. She knows what's best for her and her companions. Clemmie is affectionate and charming - even chats a bit with her people. Most of all, Clemmie wants companionship - people or another kitty for her to boss around. She has large gorgeous green eyes and a band of gold around her belly - just to show off how special she is. The girls wanted me to let you know that they are doing well. Both of them are very social and insist on being in whatever room my husband and I are in. Sara often settles in for a long lap nap if the mood is right. Sadie is still more reserved than her sister, but has her way of getting the love she needs. She is especially adept at coaxing us into tossing miniature tennis balls into the living room for her to chase. Sadie is also very talkative and purrs like a 1948 Buick when you pet her. It is a sheer delight to have these two fur-balls wrestling their way from room to room. They are very much enjoying the 4' x 5' large screen TV (picture window) that we installed in their room. They keep it tuned to the bird channel (which Dan fuels by spreading bird seed on the low wall about 10' from the window. Some of the birds will venture to the ledge right outside of the window - that gets the girls very excited. One of the things that I have observed is that they are very well behaved. They are very enthusiastic about their scratching post and play on the rattan chair next to it without scratching. I don't know what training they got in their foster homes, but I am very impressed! 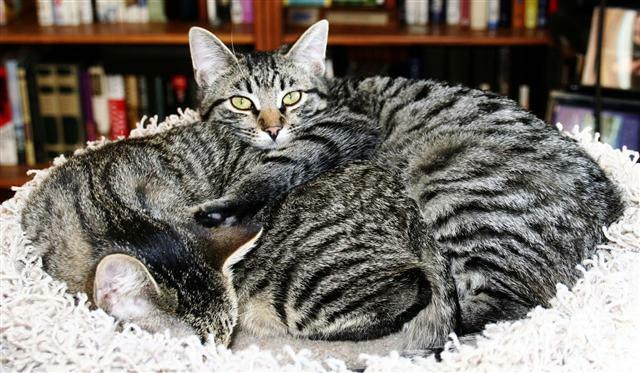 If you'd like to see your Long Beach Felines success story featured here, send us an e-mail.